This little hymn illustrates well the strong Austrian link between Church and State, and above all between religion and patriotism. In the middle of a series of songs about fallen heroes, Schubert wrote a setting about the resurrection of Christ with no more or less seriousness than his laments for Körner and his compatriots. It seems that just as Christ is designated a ‘Sieger’ – a warrior victor, the fallen warrior has achieved a kind of Christ-like status. The work appears in the first edition of the Deutsch catalogue as D987 because the dated autograph had disappeared. This came to light about twenty-five years ago; according to the second edition of the Deutsch catalogue (1978) the manuscript is in the Ogilvy of Inverquharty collection in Edinburgh. Even if both manuscripts had not proved to share the same date, hindsight makes it seem rather an easy task to link this piece with Begräbnislied D168. The key is E flat, the relative major of the C minor of Begräbnislied, and the mood of each work is a mirror image of the other; they were also both written to Klopstock texts and for SATB with piano, which is something of an unusual format for the composer of 1815. They are thus fitting companion pieces, the first burying the dead and the next promising resurrection. The most effective moment in this single page is the word-painting of ‘auferstanden’ which is the highest point in the piece and which rises dramatically in the air for a tied minim in graphic illustration of its meaning. 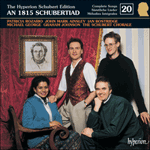 Schubert may well have written the pair for the Easter observances of 1815, as the date of 9 March suggests. Domestic performance of such sacred vocal music would be fitting for such a festival, though unlikely to have figured as part of the Catholic services at the local Lichtental parish church. However, Therese Grob who sang in the choir there may well have taken part at a gathering in the Schubert household. 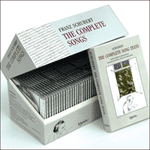 The texts are certainly serious and devout enough for the taste of Franz Schubert senior. The Lord has vanquished death!